On rare occasions in life we begin to realize that what we share is more significant than what we do not. All thirty five devotees who were on the pilgrimage to Dambadiwa had one common wish- we all aspired to ‘see the Buddha in real life’. As the Buddha himself stated in the Mahaparinirvana Suttra, every Buddhist should visit and pay homage to the four main sacred places associated with the life of the Buddha - Lumbini, Buddhagaya (Bodhgaya), Sarnath and Kushinara. Buddhists across the world annually visit India with feelings of deep devotion to worship these most venerated places. While following the Buddha’s Dhamma in true spirit, if one visits the land of the Buddha, it is almost like seeing the Buddha in real life. Buddhism was born in the state of Bihar that was called Magadha in ancient times. Patna is the capital of Bihar, then known as Pataliputra, and was the centre of the Mauryan Empire, which ruled the Indian sub continent from 325 BC to 185 BC. Emperor Ashoka was the most famous ruler of this dynasty. Most of the Buddhist archaeological sites are situated in the States of Bihar and Uttar Pradesh. Durgeshwari Rock which is situated in Bihar was the place where Siddhartha Gauthama undertook rigorous austerities (Dushkarakkriya) during the initial stage of his quest for the Eternal Truth. Our journey to Durgeshwari was an inspiring, but a difficult one on narrow paths. The people in the area are born to extreme poverty. Cattle and goat population is very high. Every cow has its own pot of food. It seems that the sufferings undergone by the poor people were imprinted in the eyes of these innocent animals as well! On many occasions our driver had to stop the jeep as cows were relaxing on the roads. The walk to the rock-top itself was a strenuous task. For six long years the Siddhartha Gauthama practised rigorous austerities on this rock. The stone cave, where the Siddhartha Gauthama was meditating was shrouded in complete darkness. Its tranquil atmosphere is ideal for meditation. The place is only limited to the rustling sounds of leaves with a cool breeze blowing across the Senanigama village. The view from the Durgeshwari rock reminded me of the time when the Siddhartha Gauthama touched the sands of this land more than 2550 years ago! Senanigama was the place where Sujatha offered milk rice (Kiripindu) to ascetic Siddhartha. Sujatha, a wealthy princess, was the daughter of the land owner of the village Senani situated near Uruvela. As recorded in the Buddhist literature, she had made a pledge that she would offer milk-rice to the God who dwelt on the Nuga tree if she could give birth to a baby boy. Her wish was fulfilled, hence, she asked her maid Punna to visit the tree and prepare the place for her offering. Punna mistook Siddhartha Gauthama who was meditating under the Nuga Tree for the God who dwelt there and reported it to her mistress. Overwhelmed by the news, Sujatha went there quickly and offered milk-rice in a golden bowl to Siddhartha Gauthama. Rajagaha or Rajgir situated in the State of Bihar lies at a distance of nearly 35 kms from the city of Gaya. 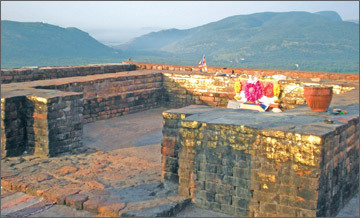 In early days, Rajgir or Rajagaha was the capital city of the Magadha Empire. The Buddha had stayed in Rajagaha during his 2nd, 3rd, 4th, 17th and 20th Vas retreats. Many sites of historical and archaeological significance are situated in the holy city of Rajgir. The mostly known hilly ranges of Gijjakuta, Isigili, Vehara, Pandava and Vepulla stand as a belt surrounding it. We visited the Gijjakuta hill, Sapthaparni caves where the first Buddhist discourse (Dhamma Sangayanawa) was convened after the Buddha’s Mahaparinirvana, King Bimbisara’s jail (the place where King Bimbisara was said to have been jailed by his son Ajasatta) and the place where 500 carts sank in a stone ground. As we have learnt in the Buddhist history Rajagaha had been a place of scenic beauty. It was at Rajagaha that the Buddha performed the miracle of taming the elephant Nalagiri sent by Devadatta to kill the Enlightened One. The Lotus Tours, Nugegoda, who organized this tour, gave us luxury facilities at star hotels with specially prepared Sri Lankan food. The outstanding Dhamma knowledge of Chandana and Jagath who guided us, deserves commendation. Trekking the Gijjakuta hill was an interesting experience. It was not as difficult as climbing the Durgeshwari rock. Gijjakuta is historically important as it was the Buddha’s favourite place at Rajagaha where he delivered many of his sermons. Also several important Suttras such as Atanatiya Suttra, Diganaka Suttra and other important Buddhist sermons were preached here. On our way to the hill top, we saw caves where Mugalan Thera and Ananda Thera stayed. Famous Sukarakatha cave is also situated here. On top of the hill, the place where the Buddha stayed had been separated by a wall of bricks. I was overwhelmed by feelings of great devotion. when I touched the sand of the sacred land on which the Buddha trod more than 2550 years ago. As you are on the top of Gijjakuta Hill, you can get a bird?s eye view of the whole village (Rajagaha) which is indeed eye-catching. The steps to the Gijjakuta hill were built by king Bimbisara who ruled Rajagaha during that time. On the same day, we visited Vaishali or Visala Mahanuwara, the Republic of the Lichchavis. It was in Vaishali that the Buddha announced the imminence of his Mahaparinirvana. People died in large numbers in Vaishali due to a shortage of food following a drought. The whole city had turned into an ugly mess with dead bodies all over. Following an invitation, when the Buddha visited Vaishali and recited Rathana Suttra, it began to rain and the devastating situation disappeared. 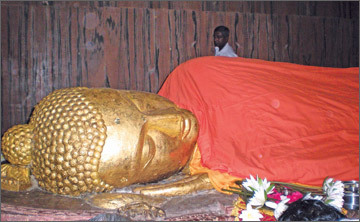 The Buddha attained Parinirvana in Kushinagar (Kusinara), a town in the State of Uttar Pradesh in India. Any Buddhist would find visiting the Mahaparinirvana temple in Kusinara a moving and touching experience. The entrance to the Kushinagar precincts itself creates mournful feelings. With flowers in our hands, we were about to see the statue of Mahaparinirvana. Perfect stillness pervades the area as if the site still mourns the Buddha’s passing away. The reclining, colossal Buddha statue in the Mahaparinirvana temple is 20 feet long and is a unique work of art. I am sure any Buddhist would get feelings of remorse as they were not fortunate enough to have a glimpse of the Buddha in real life. The Buddha’s last words came to my mind. ‘Make of yourself a light. Rely upon yourself. Do not depend upon anyone else. Make my teachings your light. After my death, the Dhamma shall be your teacher. Those who would follow the Dhamma would be truly respecting me. My dear disciples, this is the end. In a moment I shall be attaining Parinirvana. This is my instruction’. We visited the Buddha’s birth place Lumbini, in Nepal which was named after Queen Mahamaya’s Mother. Though the Lumbini today is not a garden of Sal trees, the tranquillity in the surroundings still reminds us of that important event. Kapilavastu was our next destination. It is situated in the State of Uttar Pradesh. It was the capital of the Shakya republic during the 6th Century BC. King Suddhodana, the Chief of the Republic was the father of the Prince Siddhartha. The River Rohini flows near Kapilavastu. The entrance to the archaeological site of Kapilavastu showed evidence of the remnants of a giant kingdom now lying in complete serenity. Prince Siddhartha lived in Kapilavastu for 29 years before renouncing lay life upon seeing misery and pain in life. He left his wife Yashodara, newly born son Rahula and his near and dear to explore the universal truth. It is praiseworthy that the Archaeological authorities of India have well maintained these Buddhist religious sites. Observing Sil in Buddhagaya and in Jethawanaramaya was a unique religious experience. Jetawana monastery situated in Sravasti (Savath Nuwara) was a 14 acre land donated to the Buddha by the wealthy businessman and benefactor Anathapindika where the Buddha stayed for 19 years. The Gandha Kuti (Buddha’s Chamber), Ananda Kuti (where Ananda Thera stayed), Dhamma Shala, Ananda Boddhi and many other Buddhist ruins of unique significance are all over the precincts. Many of the Buddhist Jataka stories such as Chinchi, Patachara, Angulimala are related to the Jethawanaramaya. Our visit to the ruins of the Anathapindika castle and the Angulimala Chetiya was also memorable. 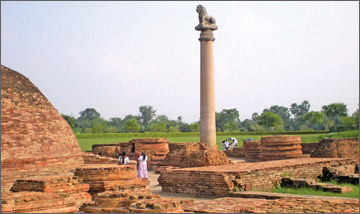 From Sravasti to Sarnath (Baranasa Isipathana) was the longest travel. The Buddha delivered his first sermon in the Deer park, Sarnath which is also among the four main sacred places that a Buddhist should visit. Though it was also called Migadaya, only a few deer could be seen today. 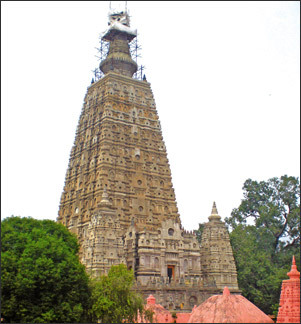 The Buddhagaya Temple is an architectural amalgamation of many cultures. Compared to the rest of the Buddhist pilgrim sites, Buddhagaya is a busy place with devotees of many traditions. This is the most revered place for the Buddhists. 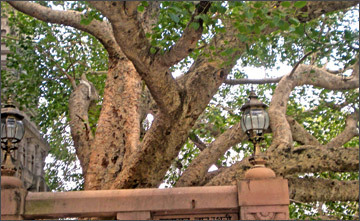 Vajrasana is the seat where the Buddha achieved Enlightenment under the sacred Bo-tree in Buddhagaya. We could see Buddhists from countries such as Myanmar, Tibet, Thailand and also devotees of the western orient paying homage to the sacred Bo-tree in their own unique ways. Buddhists all over the world owes a debt of gratitude to Anagarika Dharmapala for preserving the Buddhist historical sites from various invasions. Also Alexander Cunningham, a British Archaeologist, Chinese-monk Fa-Hien, Hieun-Tsang, the Government of India, Sri Lankan Bhikkus who stay in India and the Sri Lankan Government for launching a direct flight to Gaya are reminded with gratitude. India remains the blessed land for the past and future Buddhas. Concluding the Dambadiwa tour we boarded Colombo bound Mihin Air flight from the Gaya International Airport with deep feelings of Dhamma.